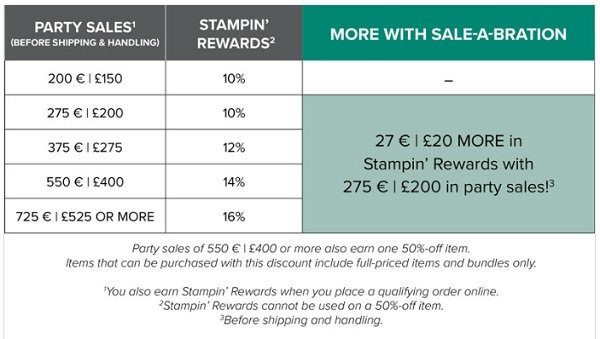 One Stamp Set At a Time Blog Hop – #simplestamping. If you are following along with the Blog Hop you will have joined me from Mary’s site. If you are joining straight with me, then welcome and please do follow the hop along. There is a list of the participants further down the post. With today’s theme being #simplestamping, I decided to limit both projects so they are easy to make for a newer stamper. I have used the new (coming tomorrow!!) Painted Seasons stamp set from the Painted Seasons Bundle from the second release of Sale-a-Bration. The added benefit of this bundle is that it is FREE! More on that later. The card uses 3 ink pads, but the main work is done by the stamps. These are made in such a way so that when you stamp with the you get all the shading without any work at all. The only tip I would give you is that you must not use a very juicy ink pad. This is a perfect set for an ink pad that needs to be re-inked! I clustered the flowers in the bottom right corner of the card and then added some leaves and sprinkle fillers. I mounted the stamped piece on some Daffodil Delight card and then on a Whisper White Card Base. A quick sentiment on a scrap of card in Mossy Meadow, added with Dimensionals and the card was finished. As I mentioned earlier, as the theme for today is #simplestamping I wanted my second item to be easy to create. I pulled a Gold Striped Bag and a strip of Daffodil Delight card. Scored one end and attached it to the back of the bag. I ‘flagged’ the other end before adding one of the flower images that I punched out with a 1-3/4″ Circle punch. Again I used Dimensionals for the flower to give an extra ‘pop’. As it happens, the card actually fits into the bag quite well, so you could use it in place of an envelope if you are hand delivering the card. I hope you enjoyed these projects, but remember that there are lots of others to look at. The next stop on the blog hop is the AMAZING Kelly Acheson, please go and take a look at her projects. I am sure she will have given you lots to be inspired by. 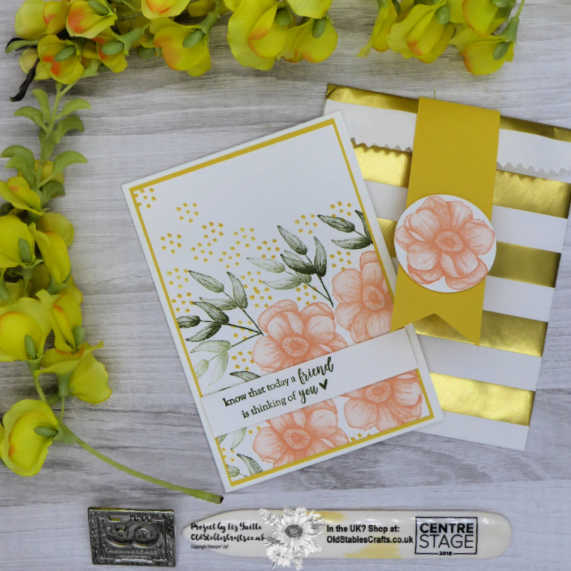 As the Painted Seasons Stamp and Paper Bundle is part of the Sale-a-Bration second release, it means that you can only get this FREE. All you need to do is to place and order at my OnLine Store for at least £90, then select this Bundle – but not until TOMORROW. Don’t worry if your order is less than this, as long as it is at least £45, you can still select FREE items. Just take a look at the CURRENT OFFERS TAB for a pdf copy of the second release items. You can still select items from the first release, while stocks last! You’ve made my favorite kind of card — just because! Beautiful! I think this is going to be one of my favorite stamp sets!